The Temporomandibular Joint or TMJ is the hinge joint that connects the lower jaw (mandible) to the skull. This is immediately in front of the ear on both sides of the head. The joints are flexible allowing the jaw to move smoothly in 6 directions: Front/back, left/right, open and close. 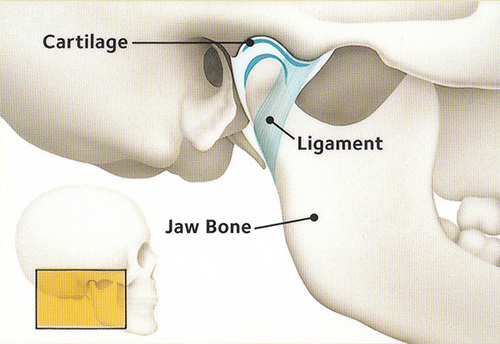 When the jaw does not fit in the proper position in the socket, temporomandibular joint disorder may result. While there is no clear cause of TMJ disorder, injury to the jaw or head and neck, tooth abrasion, grinding, clenching and degenerative arthritis are the most common causes. ‘Popping’ and soreness of the joint to severe muscle or joint pain. The pain can be acute (temporary but severe) or chronic (long term). While there is no standard TMJ treatment, various types of therapy have been used to treat TMJ disorders. TMJ treatment may include pain management with medications, muscle relaxants as well as diet control, and limiting the hardness of foods eaten. Most therapy for TMJ treatment will include some type of splint or hard acrylic guard. Because the teeth determine the position of the lower jaw in the skull, adjusting the position of the teeth is usually performed and ranges from limited grinding of the surfaces of the teeth to full mouth restoration and building up of the teeth and bite. Dr. Weisbard will be glad to discuss your TMJ symptoms and will make necessary recommendations to help give you TMJ treatment. In the video below, Dr. Lee Weisbard talks about TMJ on the Experience Pros Radio Show.